Sawai Madhopur is a small town; famous for Ranthambore Tiger Reserve in Rajasthan State of India. Most sought after Tiger Destination in India. Well connected via road and rail route from Mumbai & New Delhi. 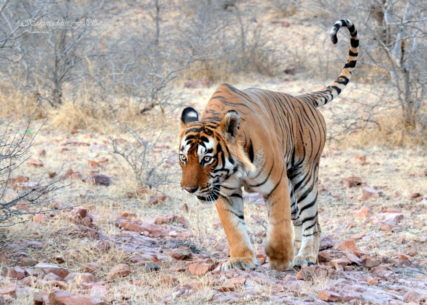 T34 aka Kumbha from Zone 6 of Ranthambore National Park, Sawai Madhopur, India. On prowl to mark his territory and stumbled upon us one fine morning when we entered the Zone 6. The Dry Deciduous Background of National Park and the hulk in front make this a powerful image. Eyes beaming with power, and Shoulders on rise, tail twitching; its a power packed muscular display of beast.